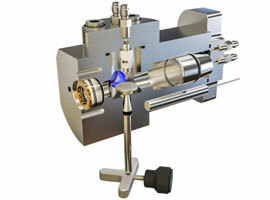 The Theta High Pressure Chamber is an add-on module for the Theta Flex Optical Tensiometer for measuring wettability and interfacial tension at high pressures and high temperatures with enhanced oil recovery research. With the harsh conditions of an oil reservoir in mind, the instrument is designed to ensure ease of use and yet offer wide measurement possibilities. Interfacial tension and contact angle measurements in high pressures and temperatures. Automatic analysis by OneAttension software will provide the results easily and quickly. Optimal for mimicking oil reservoir conditions. Interfacial tension and contact angle give an accurate and quantitative measure of the wettability in reservoirs. Unique piston design enables to use surfactants also in high pressures with constant concentrations. In order to gain the maximum yield from an oil reservoir, methods grouped under the name enhanced oil recovery (EOR) are used. One common EOR method is to use CO2 to both dissolve and displace oil in a reservoir. To study the effectiveness of the CO2, the wettability of it can be measured by using interfacial tension and contact angle measurements. The interfacial tension between CO2 and brine, for example, correlates with how easily carbon dioxide can be pumped into the reservoir. Likewise, the contact angle of an oil drop in a carbon dioxide environment gives a measure how well the CO2 can displace the oil on rock surface. 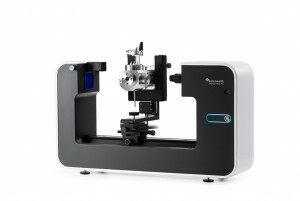 The Attension High Pressure Chamber is an advanced add-on module for the Theta optical tensiometer, enabling to perform interfacial tension and contact angle measurements in high pressures and temperatures. The chamber includes a unique piston design which is especially useful in any studies including surfactants. Traditionally, the pressure is increased within a chamber by pumping more fluid into it. However, when surfactants are used in the measurement this will lead to a situation where surfactant concentration will also change while changing pressure. In order to eliminate the issue, in Attension High Pressure Chamber the pressure can also be increased by using a movable piston inside the chamber. The piston will compress the fluid in the chamber without the need to pump in more fluid. Therefore, both surfactant concentration and measurement pressure can be controlled independently. The chamber itself is CE-marked and made from high quality stainless steel. It is easily removable for cleaning purposes.